Born in 1939 and working from his studio in North Yorkshire, David has been a regular exhibitor with the Wykeham Gallery for many years. His paintings are primarily of landscape and marine subjects, but he is also well known for his equestrian racing pictures. He works in watercolour, oils and pastels. 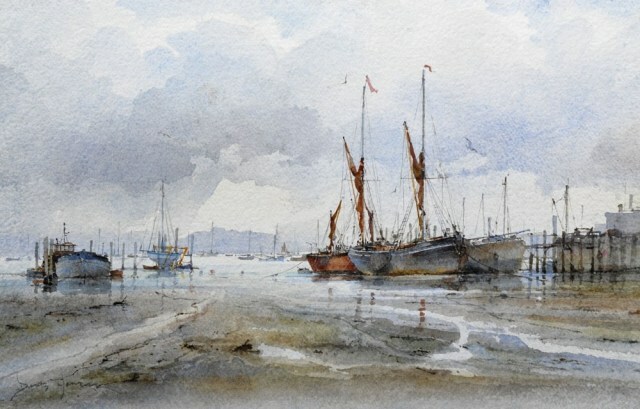 David has exhibited widely in galleries nationally and internationally with both one-man and mixed shows, including at the Royal West of England Academy, the Royal College of Art, the RI and the Royal Society of Marine Artists and his work hangs in corporate and private collections worldwide. David’s approach to painting is very much concerned with capturing atmosphere and a sense of time and place, with an emphasis on producing good paintings rather than topographical accuracy. He works outside as much as possible and travels extensively. He is equally likely to be seen standing with a sketchbook on the North York Moors, as to be found sitting by a canal in Venice or dragging an easel through the Arabian Desert. David is a past President of the Royal Society of Marine Artists and has been a member of the Society of Equestrian Artists. His book 'Painting with Watercolour’ joined the previously released ‘Painting with Oils' both have been published by Crowood Press and are best sellers for both students, aspiring painters and enthusiasts. David also writes articles for magazines, appears on APV Film's DVD 'Just Watercolour' and is a popular tutor on a limited number of painting courses both in this country and in Europe.